Do we need to say more? 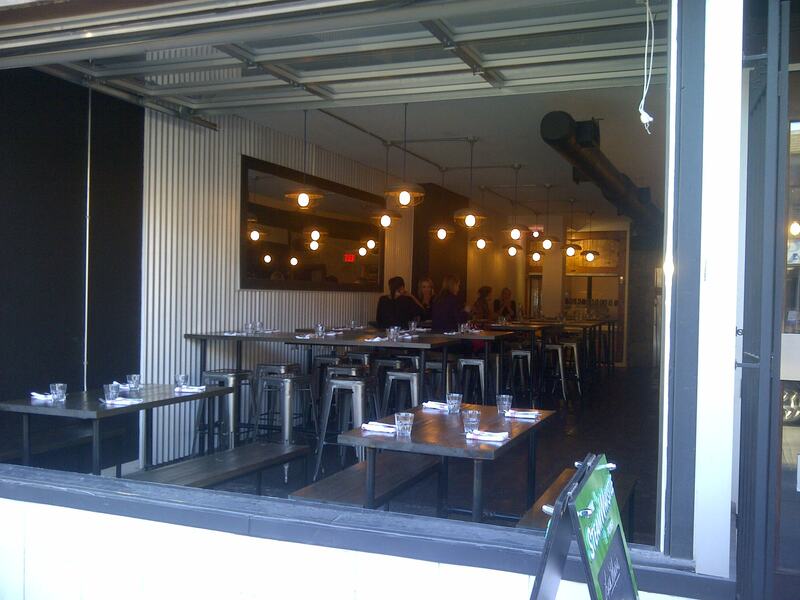 We don’t think so, but we DO owe you a resto review now that we have piqued your curiosity! If you love watching Travel + Escape, then you’re familiar with Rebel Without a Kitchen hosted by Matt Bastile. Or, you may have seen his famous Fidel Gastro’s food truck Priscilla out and about in the city. If you’re not already drooling, just wait until we share our thoughts on his new restaurant – Lisa Marie – on Queen St W.
There is a huge window at the front of the restaurant ideal for people watching OR to be on display as you stuff your face while people walk by. The restaurant is very spacious with a lounge feel. All the tables, except for the two by the window, are bar style and go along the far wall, with the bar on the opposite side. We had the pleasure of meeting the restaurant manager Sarah, who took us on a tour to the back where there is a set-up displaying meat, sauces and pickles available for purchase. 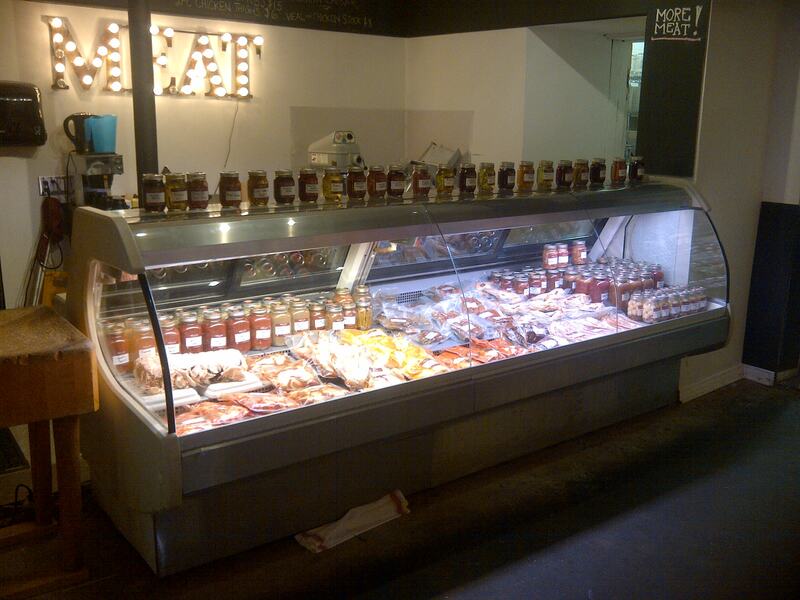 Lisa Marie will even sear the meat on site so that all you have to do is take it home and finish it off. Lisa Marie got pretty loud as it filled up, but it was never a problem. Like the feel of the restaurant, our server Andrew was very friendly and laid back. There was no sense of being rushed and he was very helpful when we were trying to decide what to order. Andrew and Sarah were both helpful in describing dishes and making suggestions. Lisa Marie has a seasonal menu , as well one listing daily specials. The seasonal menu features share plates as well as smaller tapas dishes known as “cicchetti”. 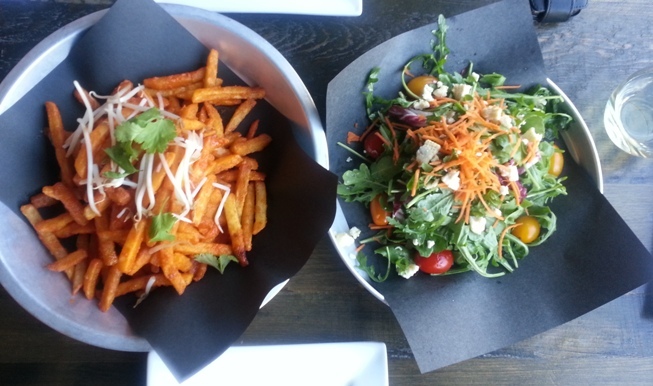 We went for the large share plate of pad thai fries, because …well…PAD THAI FRIES! Ash insisted on a salad to balance out all the yummy not-so-healthy items we were about to consume. We ordered the fries sans pulled pork because Chris doesn’t eat beef or pork. The fries came tossed in delicious sauce with bean sprouts on top. The sauce reminded us of Buffalo chicken wing sauce. It was tangy and salty (in a good way) with just enough heat. We would definitely have these again! 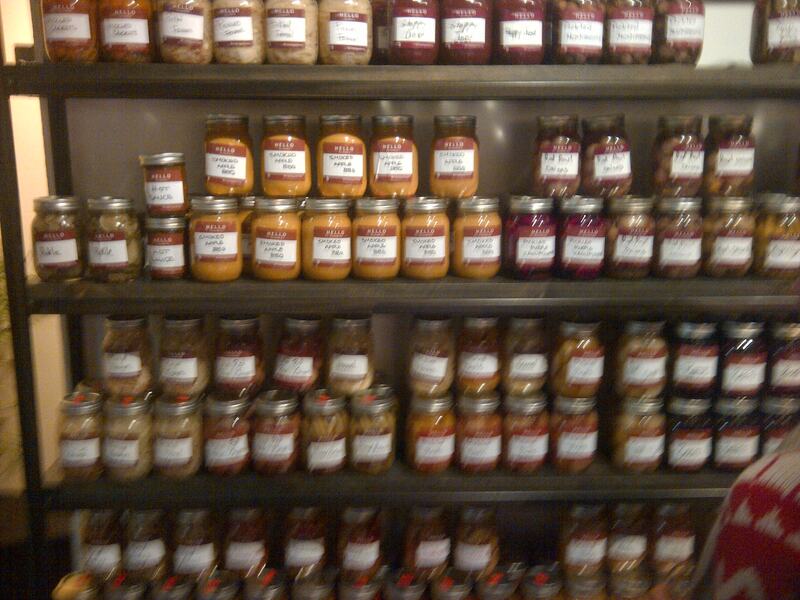 Next up, our Cicchetti choices. On Tuesday nights Lisa Marie features an all in cicchetti special, where you can get all of the items on this menu for $85. We were going to do this, but many of the dishes featured beef or pork – a no go for Chris. So, we went with the options that didn’t have these meats. First up, Deep-fried pizza with smoked duck. 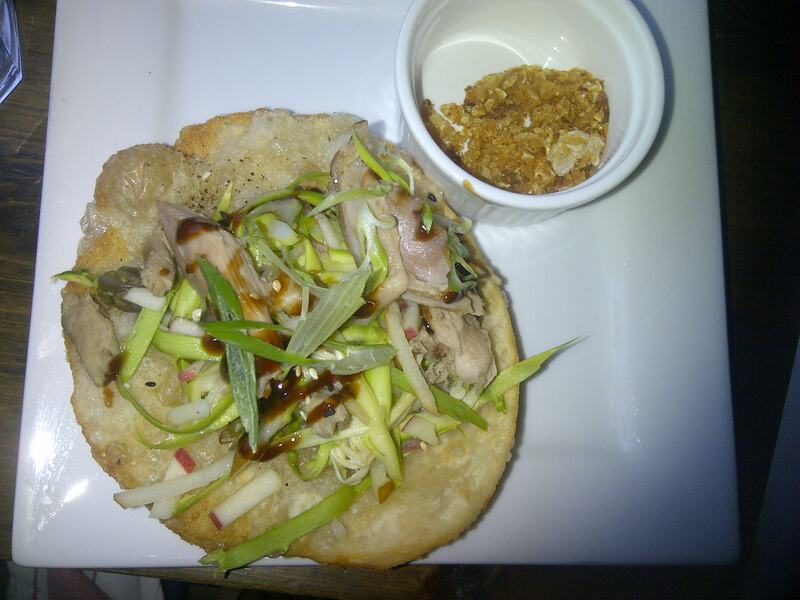 A fried mini dough was topped with whole Brome Lake duck, hosein sauce and enoki asparagus slaw. It usually comes with chicharron (pork rind), so Ash opted to have it on the side. This was so yummy. The flavours were simple and complimentary and the fried dough was to die for . You know a pizza is well done if we don’t miss the presence of cheese! And we LOVE cheese to no end! 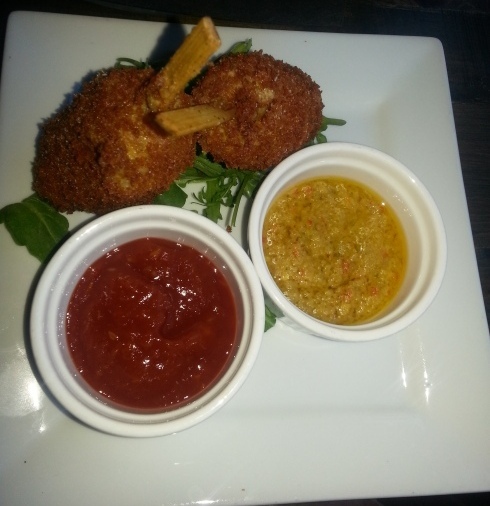 The Snow crab pogo was absolutely delicious, and another TNL favourite. This dish was made with Crystal Award winning Louisberg crab with green onion. It was served with house made chili ketchup (which Ash, the ketchup hater, promptly passed on) and scotch bonnet dipping sauce. This was like the best crab cake ever, and on a stick. And you know when you normally order crabcakes at a restaurant, they’re usually small? Not at Lisa Marie! The picture doesn’t even do the size justice. Winning! If you love crab and you plan on visiting, we highly recommend this dish. Only ever having had puttanesca sauce with pasta, we were a bit unsure what to expect with the fresh Tuna puttanesca roll. However, the tangy, salty puttanesca flavours worked really well with the ahi tuna. The flavours of bean srout, red pepper purple cabbage, carrot, basil and cilantro added freshness and crunch. 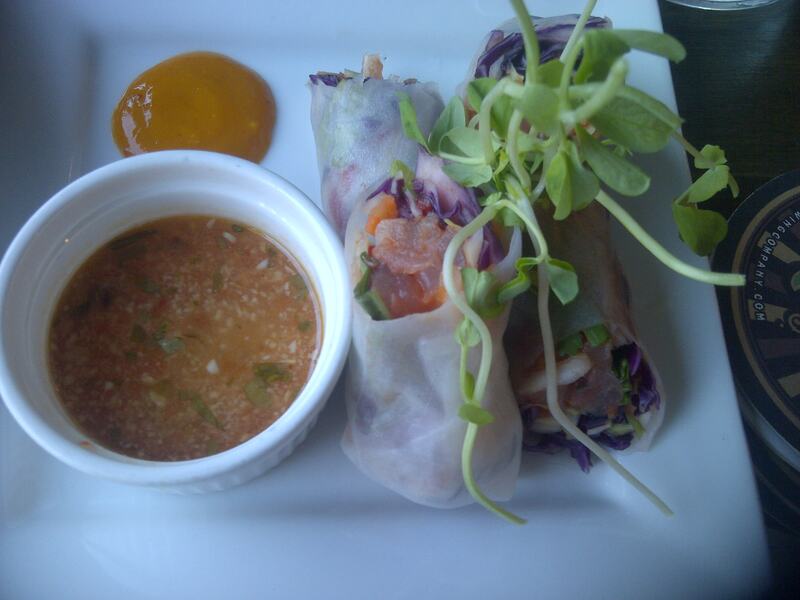 This yummy roll was great paired with sweet and sour mango sauce. 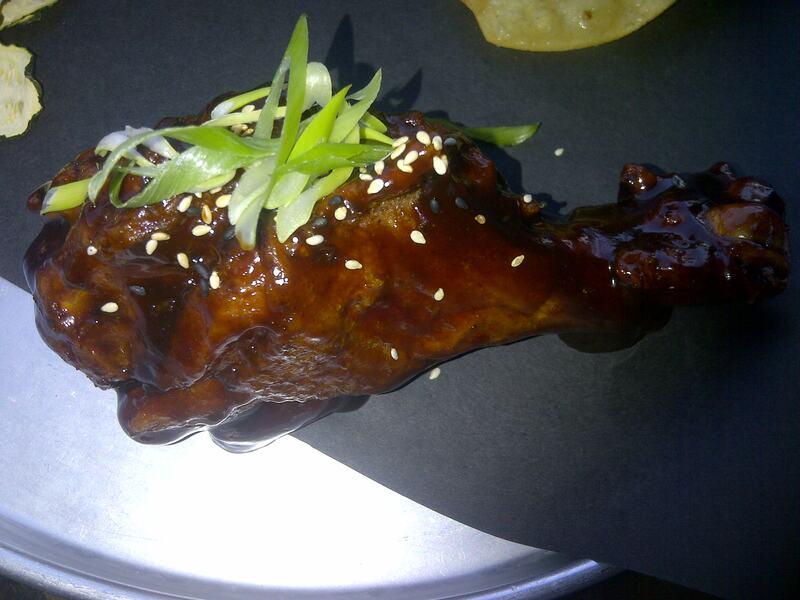 Next up, a Hoisin turkey leg. The sauce on this leg was so tasty. At this point we were getting mighty full, but the sauce kept us tucking in for more. Sweet and smoky, this was a tasty choice. It was a nice twist on preparing a turkey leg, and Chris couldn’t put it down… Although at this point she should have, because we were both really, really stuffed! Another dish we highly recommend. Our least favourite selection of the evening was the Eggplant in a jar – which was not in a jar at all come to think of it. We should mention that it wasnt that this dish wasn’t tasty. It was just that everything else was SO tasty in comparison. Also, by the time we got to tasting it, it was no longer hot at all and this may have contributed to our opinions of it. 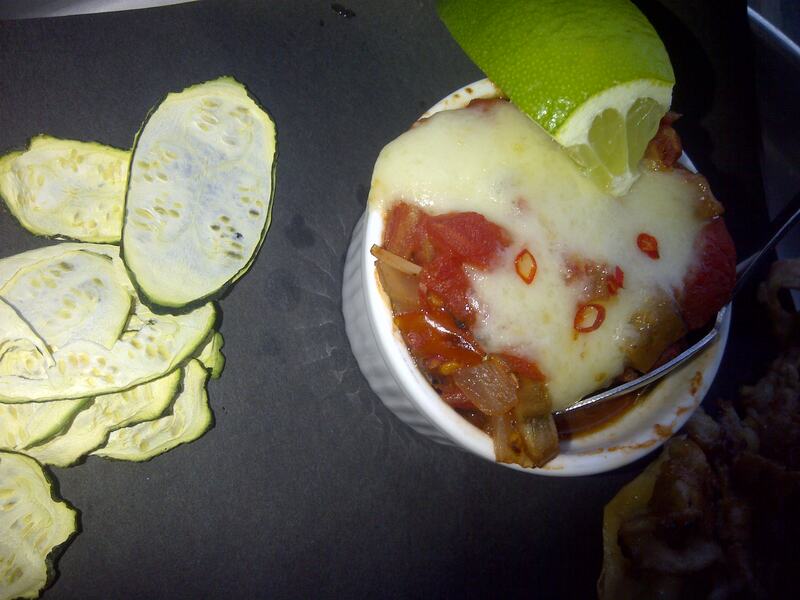 Served with zucchini chips, brined eggplant was served with cheese, Thai chilis and fresh lime. Although Chris does not eat beef or pork, Andrew and Sarah suggested that Ash give one of their beef dishes a try. It doesn’t take much to twist Ash’s arm , so she was on board. 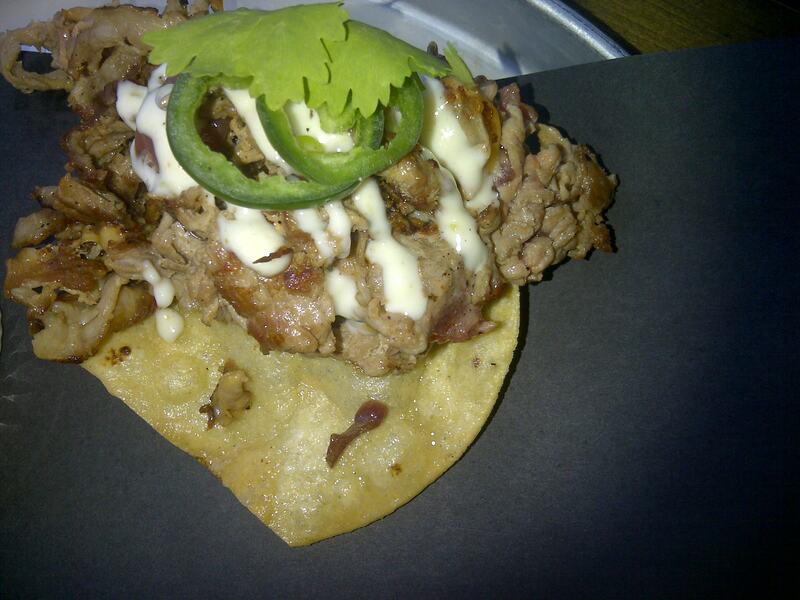 The Philly beefsteak tostada featured shaved beef striploin, red onions, jalapeno and cilantro. The beef was tender and flavourful. Ash particular enjoyed this with some of the scotch bonnet sauce that was served with the crab pogos. 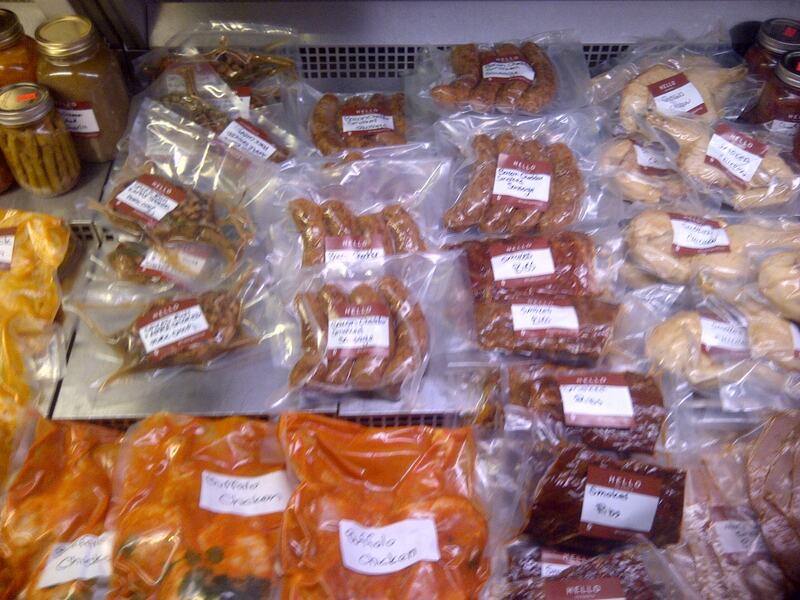 So, is your mouth watering yet? We feel full all over again just from writing this! After this dinner we were bursting at the seams! The total for our meal and one glass of wine was just under $100. A bit steep for the size of the tapas plates, but they were all made with fresh top quality ingredients and we left super full. Plus, we probably ordered more than the average party of two might have because we wanted to try as many dishes as possible. 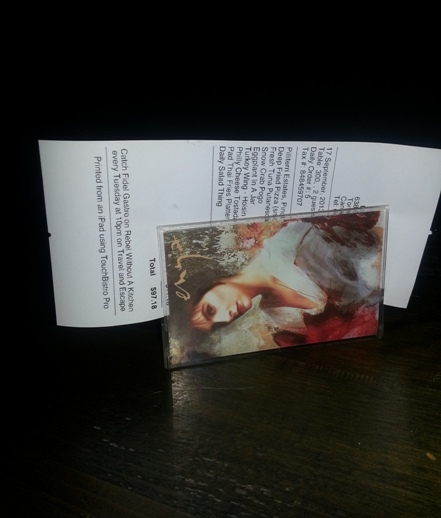 The cheque was presented to us in an old school cassette tape case. 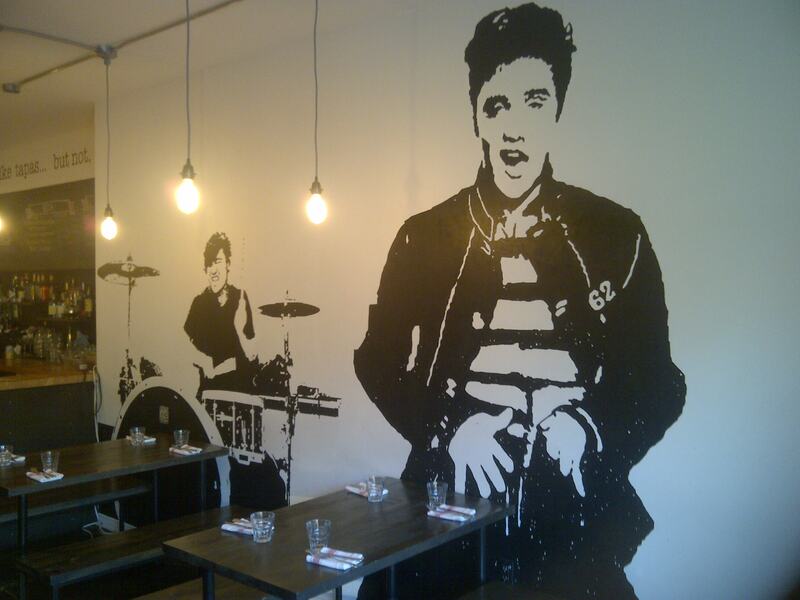 Nice touch, but Enya was an odd choice for an Elvis-themed resto, no? At Lisa Marie, the staff was incredibly nice and the ambiance was fun and whimsical. It was obvious that the menu was selected with great care, with attention paid to what is in season and creativity. It was challenging to identify items without pork and beef (even the two desserts offered to us had meat!) but we ended up with more than enough food from the options without these. Staff was also always more than happy to put the beef or pork on the side. We would certainly return to Lisa Marie. In fact, we plan to. 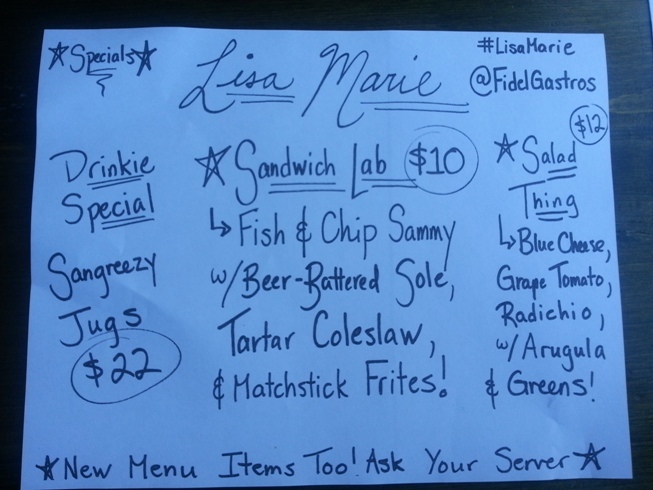 Have you been to Lisa Marie, or the Fidel Gastro food truck? Lisa Marie is located at 638 Queen St W, (647) 748-6822. TNL Travels-Choose Your Own Adventure!